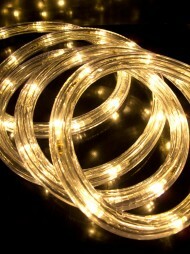 Rope lights are a decorative item that is growing in popularity in recent years. 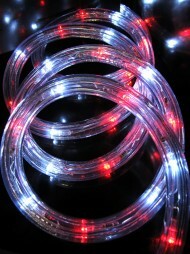 Also known as tube lights, lite rope and flexi impact lights, these lights are durable and beautiful. Encased in a tube for protection, these lights are suitable for indoor and outdoor use. The circuit of light is not broken by the loosening of a single bulb and their encasement makes them easy to use. You can wrap rope lights around just about anything. Some connect to other rope lights for large scale projects. Some of the rope lights are available in LED. LED lights will help the rope lights to shine brighter in the night sky. LED lights also decrease your electric bill by using less energy to power the bulbs. LED lights are also proven to last longer. The environmental and safety concerns are a great reason to make the switch to LED. The rope displays are available in a number of different colours, sizes and lengths. From Christmas shades to colours that can be used year round, the Christmas Warehouse has a wide selection of rope light options. 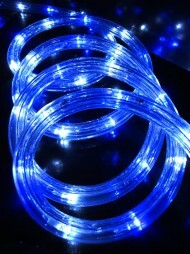 Many of the rope lights have settings that can be set for different light effects. For lights that will shine year after year, consider rope lights. They are durable and less destructible than traditional lights. Easy to install or use, they can be placed nearly anywhere with ease. 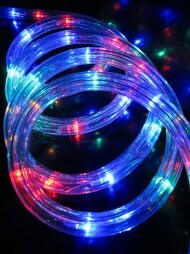 The Christmas Warehouse also has a large variety of rope light displays for your home, both indoors and out. Check over the vast selection and try out this popular new lighting technique soon.